UNMC › Psychiatry › About the Department › Faculty › Daniel E. Gih, M.D. 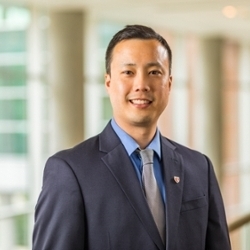 Daniel E. Gih, MD is Associate Professor and Co-Director of Medical Student Education in the UNMC Department of Psychiatry. Dr. Gih came to UNMC in June 2016. He currently serves on the UNMC College of Medicine Curriculum Committee, and he will direct the new UNMC psychiatry residency program, which starts in 2020. He completed his medical education and training in the Big Ten; medical school at the University of Iowa, and training in adult and child psychiatry at the University of Michigan. Dr. Gih stayed on the faculty there for five years. While on the faculty at Michigan, he co-founded and directed the University of Michigan Comprehensive Eating Disorder Program, the state's only academic partial hospitalization program for eating disorders for children and young adults. His clinical interests include psychiatric education, severe mood disorders in adolescents, electroconvulsive therapy, and eating disorders. Dr. Gih holds an adjunct faculty position at the University of Michigan and is a fellow of the American Psychiatric Association (FAPA).